1 The king of Syria had high admiration for Naaman, the commander-in-chief of his army, for he had led his troops to many glorious victories. So he was a great hero, but he was a leper. 2 Bands of Syrians had invaded the land of Israel, and among their captives was a little girl who had been given to Naaman’s wife as a maid. 3 One day the little girl said to her mistress, “I wish my master would go to see the prophet in Samaria. He would heal him of his leprosy!” Elisha is this unknown prophet. 4 Naaman told the king what the little girl had said. 5 “Go and visit the prophet,” the king told him. 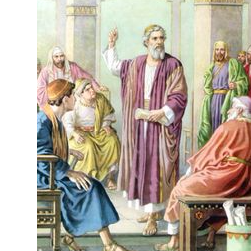 “I will send a letter of introduction for you to carry to the king of Israel.” So Naaman started out, taking gifts of $20,000 in silver, $60,000 in gold, and ten suits of clothing. 7 When the king of Israel read it, he tore his clothes and said, “This man sends me a leper to heal! Am I God, that I can kill and give life? I want to stop here to give you some additional explanation. The nation of Syria was located northeast of Palestine. Through much of their history, they were a threat to Israel. When Ben-hadad, the king of Syria, heard that there was a possible cure for Naaman in Samaria, he showed how he valued this captain by his promptness in sending him to Samaria and by the size of the gift for his healing. Naaman and his letter arrived at the king’s court, but the king of Israel was horrified to think that Ben-hadad would so subtly ask him to heal a leper. He thought Ben-hadad was attempting to instigate a war. Now, let’s pick up our text at verse 8. 9 So Naaman arrived with his horses and chariots and stood at the door of Elisha’s home. 10 Elisha sent a messenger out to tell him to go and wash in the Jordan River seven times and he would be healed of every trace of his leprosy! 11 But Naaman was angry and stalked away. “Look,” he said, “I thought at least he would come out and talk to me! I expected him to wave his hand over the leprosy and call upon the name of the Lord his God and heal me! 12 Aren’t the Abana River and Pharpar River of Damascus better than all the rivers of Israel put together? If it’s rivers I need, I’ll wash at home and get rid of my leprosy.” So he went away in a rage. 14 So Naaman went down to the Jordan River and dipped himself seven times, as the prophet had told him to. And his flesh became as healthy as a little child’s, and he was healed! If I were to ask you, “What kind of Christian does God use?”—I believe that it’s possible that every one here would have a different answer. We tend to believe that God only uses the “perfect person,” but we have discovered a wonderful truth in the Bible; God uses little people in big ways.  Second; The King of Israel—we don’t know who he was.  Third; Naaman was the commander-in-chief of Ben-Hadad’s army. He was a great hero to his people, but unfortunately, he was a leper.  Forth; A little girl who was captured in Israel and given to Naaman’s wife as a maid. The days in which she lived were hard and cruel. There was continual warfare between Ben-Hadad, King of Syria, and the King of Israel. However, at that point in time, the army of Israel was dispersed through-out the region and no longer able to resist Syria.